Briquette press production - Straw briquetting production line - Brunner Ltd.
Briquette press production – Straw briquetting production line – Brunner Ltd.
One of the best ways of utilization of straw is straw briquettes. Brunner Ltd. manufactures high-performance straw briquette product line of its own design. Briquette press. Complete straw briquetting production line with bale opener. The briquette presses produced by us are capable of processing the diverse, naturally renewable raw materials for producing new, commercial products. With the help of the briquette presses, there is no need for a binder to produce briquettes. We make solid, high quality firewood briquettes which are more practical when burning a fire. We began to manufacture our industrial briquetting equipment of our own design 10 years ago, and we are continuously developing it according to the needs. 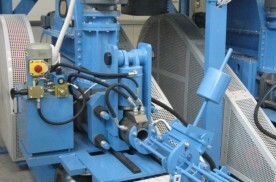 However, it is possible to use the briquetting machine for pressing the fodder and bedding. We offer a complete, automated system from the opening of the truss till the sacking. Our self-developed and manufactured machine line is capable of application and is an authentic Hungarian product.